A first impression means everything and the suit you wear speaks volumes. 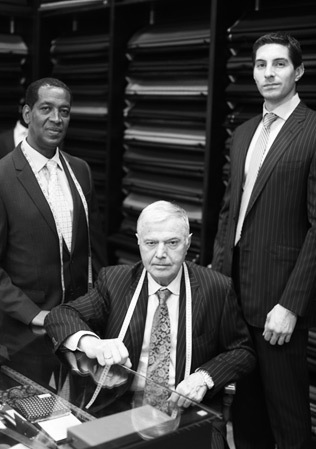 With a bespoke suit from Geoffrey Lewis, you can have the confidence to command the room. Each of our custom made suits is the product of at least 25 precise measurements, with posture and shoulder reads to ensure the perfect fit. A full canvas is included with our handcrafted suits and clients can choose from an endless variety of linings, horn buttons, and the finest wools the world offers. Unlike made-to-measure suit, which limit personalization, a Geoffrey Lewis custom suit gives you the flexibility to adjust lapel widths, shoulder padding, button stance, and an array of other styling options. We understand that each client is unique and no body is the same; our custom suits ensure an exceptional fit and comfortable wear designed specifically for you. 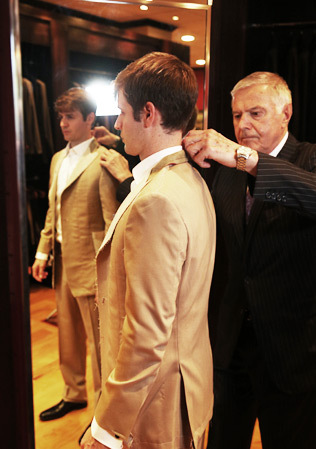 Our custom suits start at $1,200. Prices vary based on fabric selection. Call or email to set up a free consultation to view available fabrics and discuss pricing.